NAC Appliance Version 4.6.1 was release yesterday. The new NAC Agent can be installed and launched on 64-bit versions of Windows XP and Windows Vista, and can perform posture assessment and remediation on client machines. 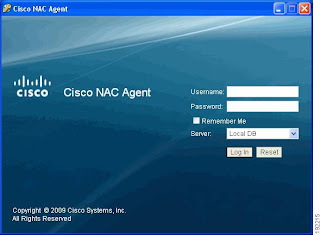 Earlier releases of Cisco NAC Appliance provided only authentication support for 64-bit client operating systems. This XML configuration file method of setting up Agents on client machines replaces the previous Clean Access Agent configuration schema requiring Windows registry setting manipulation for custom parameters. No more registry changes, hooray! 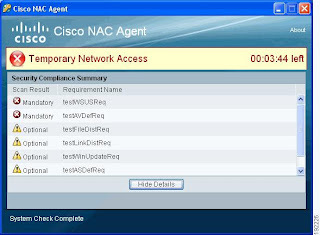 If you previously employed Windows registry settings to adjust Clean Access Agent behavior on client machines, you must specify the same settings in the XML Agent configuration file to preserve Agent behavior using the Cisco NAC Agent. This upgrade has a ton of new agent features, as you can see in the above images, so make sure to check out the release notes and read for yourself.